I present to you… the best way in the universe to eat garlic bread. This is basically I-don’t-even-know-what-to-do-with-myself garlic pull apart bread. It is absolutely insane and fluffy and delicious and covered in melted butter and parmesan cheese and tons of fresh chopped herbs. I bet we can’t find any other better way to use up the last herbs of summer, right?! And roasted garlic? I mean, just look at this caramely-ness. So something has come over me in the last few weeks where I’ve wanted alllllll the pull apart breads. I’ve actually already made THREE to share in the next three months which is legitimately insane but I love them all so much that I can’t not share them. This is the first and one and therefore the first warning that there is sooooo much more pull apart bread to come. Which is odd, because pull apart bread is kind of old school. But not, like, “old” old school, like oh-hey-I-made-it-in-the-90s old school. It’s more like pinterest-popular-in-2013 old school, sort of like the neon statement necklace I wore yesterday that most surely is out of style but still just so pretty. It’s like that. And five hundred times more delicious. I first made this orange cinnamon pull apart bread back when I was super pregnant with max, so maybe it’s something that comes over me in the last few weeks of pregnancy? The base recipe is originally from my friend Cindy and it just makes the most perfect pull-apart bread ever. Can’t even find the words to tell you how much I love it! Except… maybe I can because when am I not wordy and rambly? Huge question mark. Today is a super special day because it’s Eddie’s birthday! 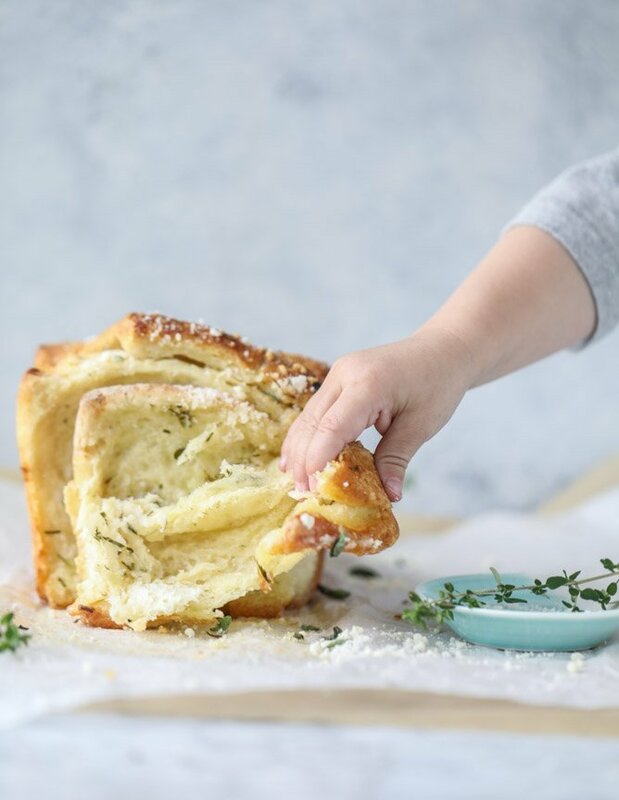 We’re celebrating with this garlic parm pull-apart bread because if there is anything else that Eddie loves as much as chocolate chip cookies, it might be garlic bread. Like I actually remember us making “garlic bread” in his apartment shortly after we started dating which most likely was made up of two slices of Ezekiel bread, drizzled with olive oil and sprinkled with garlic powder and toasted in the oven. Things are just a leeeeettle better now, I think we can both say that for sure. Now for this fluffy goodness? We’re covering the dough with melted butter, cheese and roasted garlic. I’ve decided that should be the new trifecta because it’s 100% insane and one of the most fabulous combos I’ve ever eaten. Once it’s all sliced and smashed together and rises with the yeasty goodness (the best! ), it’s covered in MORE butter, extra cheese and lots of fresh herbs from the garden that are THISclose to saying sayonara to the summer. Pretty sure we can ALL agree that no other bread needs to exist in this moment. Preheat the oven to 350 degrees F. To roast the garlic, slice off the top portion of the garlic head to reveal the cloves. Lightly rub back and forth to remove the paper and peel any excess paper off. Pour a bit of olive oil over each bulb. Wrap the bulbs tightly in foil and place in the oven. Roast for 45 to 60 minutes, until the cloves are caramely and golden. Let cool slightly. Squeeze the cloves out into a bowl and add the salt. Mash the cloves and salt with a fork. Place the milk and butter in a small saucepan and heat over low heat just until the butter melts. Remove from the stovetop and let sit for 2 to 3 minutes, then stir in the water. With the dough hook attached to your mixer, stir in the milk and butter mixture until combined. Add the basil, oregano, rosemary salt, garlic powder and the eggs – one at a time – beating well after each addition. The dough will be very sticky! Add the remaining 3/4 cup flour gradually, beating for another 2 to 3 minutes until the dough comes together again. It should still be sticky. Place it in a well oil bowl and cover with a towel. Let it rise in a warm place for 1 hour. After one hour, punch the dough down and turn it out on a floured surface. Roll it into a large rectangle, about 12×20 inches if possible. Add the filling: brush the dough with the melted butter, gently spread the roasted garlic over the dough and sprinkle with the parmesan cheese. Use a pizza cutter to slice the dough into 5 strips from top to bottom – lengthwise. Stack the 5 strips together, then cut them into 6 sets of squares. Preheat the oven to 350 degrees F. Place the pan in the oven and bake the bread for 35 to 40 minutes, until the top is golden brown and set. Remove and let cool for 10 minutes, then gently turn the bread out onto a flat surface. Sprinkle with fresh herbs like basil, oregano and rosemary and give it an extra sprinkle of parmesan. Totally going to take a nap right in there. Wow, this both looks and sounds so incredible! 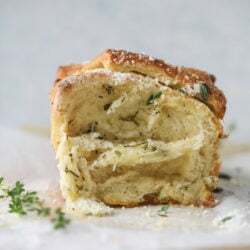 Garlic bread has always been one of my favorite foods, but I love this pull-apart version! As much of not a baker I am, you had me at roasted garlic. you can see the stacking and layering! This is the greatest technique for garlic bread, I’m pulling my garlic head apart as we speak and this something my picky girls will eat too! Although Charlotte may want the chocolate chip cookies instead. Do you think I could slip the cookies in between the layers? I just had a baby, and don’t feel like making the dough. Would it be conceivable to use pizza dough from the deli section of my grocery store? I recognize you are making a dough with egg and milk. . . but, still. . . Happy Birthday Eddie! This is a change from the wild dessert creation you usually make for his birthday! This looks amaaazing. That roasted garlic? Agh. Also Max’s little hand reaching for the bread? Too cute. I don’t think my life will be the same after reading this recipe. I will at least need larger pants. Holy *%$! I love garlic bread and when my bf and I first got together we used to make midnight batches of garlic toasts too! Happy birthday Eddie! I hope someone pre-ordered Taylor Swifts new album for you! P.S. Your tub art is ON POINT! Wow! I seriously can’t wait to try this! Doggone! We won’t be home for six weeks and I can’t wait to make this bread — all my equipment is at home. Love, love, garlic bread and I can imagine that this is absolutely heavenly. I’ll have to serve this with our homemade ravioli!! Happy Birthday, Eddie. I feel like I’m sharing in the festivities. Have a great day!! hey girl- Happy Birthday Eddie! My husband’s birthday is Saturday! This bread looks oh so yummy! I will never, not ever, grow weary of that cute little hand making cameos in your photos! Melts my heart every time! Cruel. Just CRUEL you are for showing me these pictures. I’m in danger of drowning in a puddle of my own drool right here. This bread is like…lifetime needs right here. I’m an experienced cook, and I followed the recipe exactly, but something must have happened because it did not turn out. The bread was crumbly. Love the idea, though! Just made this last night and we loved it!! My seven year old daughter is learning how to cook and bake, so she even measured out everything herself, AND cut the dough into the slices. It was fun to make and turned out perfect. Ours was not crumbly, it was very soft and scrumptious. Will definitely make again. Thank you so much for the recipe!! Pingback: More ring pulls and haircut-reducing IQ – Craft-a-licious . .
How do you do the yeast? Add amount dry to flour mix or activate in liquid then add 2 1/4 tsp of the activated liquid? New to breads, so appreciate tips! I was so busy drooling over the pics I totally blew past the recipe, then wondered where it was! Can this recipe be adapted to a bread machine for the dough part? Yum, I can live off this bread…happy feasting. This bread was mediocre. It took a lot if time and effort but had very little flavor. I think it needs more salt or should use salted butter. Won be making again. This was awesome! My first time using yeast too! Thanks for the recipe! 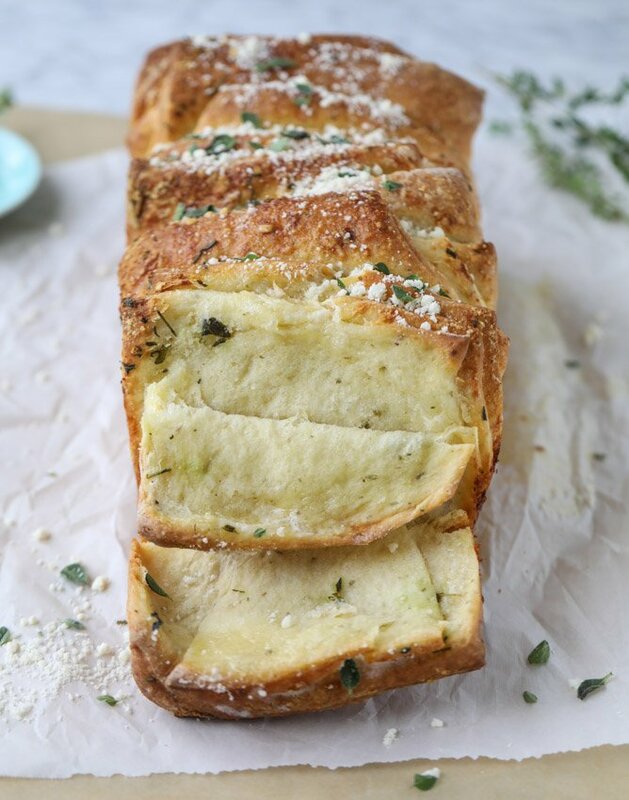 Garlic bread is something that can go with all meats and i love this recipe.